If you woke up from a bender in Ford's press event this morning, you'd have seen a large scaffold full of buff men in construction outfits spraying showers of welding sparks and pounding large hammers into girders with rippling muscles glistening with sweat. And, based on this and the loud, blaring industrial music, you'd probably think you were in a gay dance club. But you'd likely realize you were wrong when the large truck was lowered from the ceiling and then mobbed by men far too poorly dressed and out of shape to ever be in such a club. The truck was the Atlas, Ford's new concept for the future of the F-150. While it's a concept truck with more than its share of opulent concept car indulgences, it's also very clearly still an F-150. All the usual F-150 styling cues are there, only more so. There's the trademark beltline drop and kink, the proportions still retain the F-150 bulldog-beefiness, the taillight treatment fits the same basic profile even if they're now the rounded-rect shape that's infected pretty much nearly every taillight today. The front end's styling is the most dramatically different, though still clearly F-150 based. I find the front grille a bit baroque and fussy, with a number of intersecting bars and openings and slots of varying weights and thicknesses. The headlights are show-car extravagances, LED units with blue glowing piping. 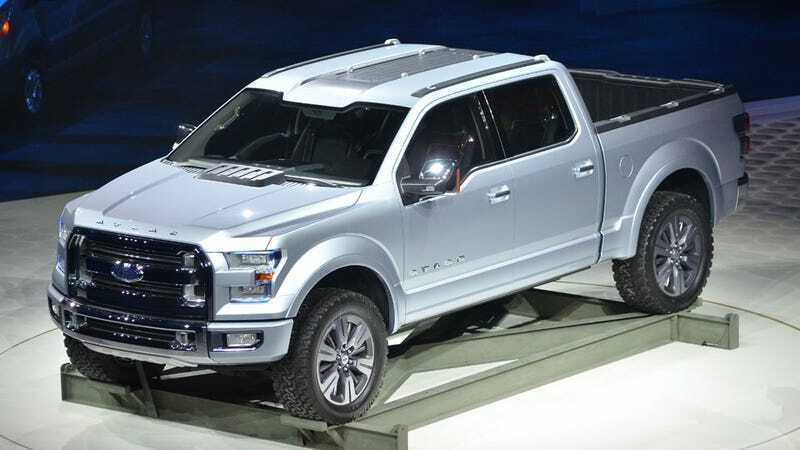 The concept is built on the F-150 platform, and retains the general dimensions, though it is a bit wider, and Ford said it'll be powered by a "next-generation" EcoBoost engine. The real changes body-wise, however, are in active aerodynamic features. The grille features adjustable shutters that would open when more cooling is required (idling in traffic on a hot day) and close for aerodynamic improvements for, say, highway cruising. There's also a dynamic chin spoiler/front air dam to help with aerodynamics, and each wheel has a set of active, spring-loaded shutters that can close to improve aero performance at speed. I felt these with my hand, and based on the hard duty and environment these trucks will likely face, it's hard to picture them staying intact long. But this is just a show car, so I imagine they'll figure it out. There's a number of other interesting features designed based on the kinds of work these trucks tend to do. There's a very nice little inverted-U-shaped hydraulic frame that raises out of the tailgate to assist in managing long cargo. If you've ever tried to haul a dozen 12' 2x4s you can imagine how handy something like this could be. Though they didn't mention it, with this thing extended and the tailgate down, you could drag an idiot/friend on roller skates for an excitingly pants-soiling asphalt-skiing session. Most tantalizing and least explained was a trailer backup assist system. As someone who's blocked traffic horribly backing up trailers, this is very exciting. The interior is full of leather and screens and some very clever removable aluminum-and-rubber floor mat tray things — possibly representing the pinnacle of floor mat technology. Also, the roof features an integrated cargo area/rack system for oversize bed cargo tie-downs or smaller item storage. All these features combine into a well-thought-out truck concept. I talked to Ford Design Head J Mays about the truck and the word he kept saying about it was "intelligent." That word choice reflects a bit of defensiveness to the perceived lo-brow nature of full-sized trucks. If the "intelligence" takes the form of useful tools like they hinted at here, that'd be great, and not the awful attempt to move a truck higher up the brow that was J Mays' old Lincoln Blackwood. Even though I was really, really hoping for a small or even mid-sized truck (J Mays told me, basically, not a chance) this does seem a rationally-thought out concept. Hopefully the clever bits will make it to production, and not just the overdone grille and fancier interior.